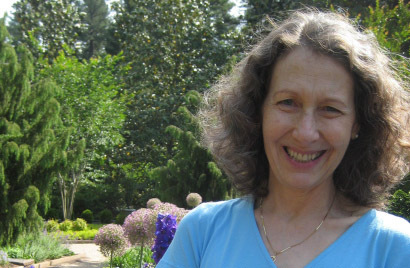 Ruth Hirsch, a member of our International Leadership Council, will be teaching a comprehensive Focusing Basics program that includes an 8 week online course. 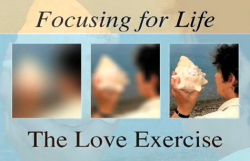 You'll gain a basic understanding of Focusing, and the ability to use Focusing by yourself and with a partner. Because this is an online course, it is perfect for those who do not have introductory courses available nearby. 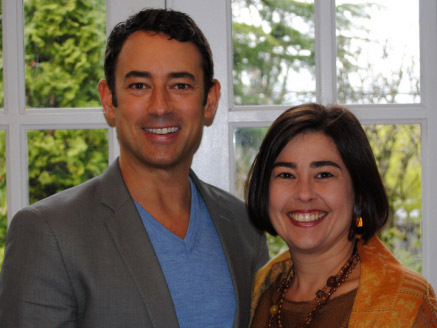 This month's Focusing Conversation features a discussion with Alexis and Shaun Phillips about trauma, abuse and the ability to heal. They discuss how the awareness of connection to ancestors and the land helps with this work. This is part of the "Conversations" series hosted by Serge Prengel. In September, we posted an audio recording of Serge Prengel talking about a practice he calls Active Pause. In this recording, he describes the similarities and differences with Focusing, and how it can complement our Focusing practice. Imagine yourself on a beach with gorgeous sunsets. Imagine that you can immerse yourself in the ocean at any time of the day or night and the water is the absolute perfect temperature. Imagine eating fresh, organic, delicious meals. Imagine sharing all of this with friends, or better yet with new friends you've just made. Imagine a night of dancing to a Latin beat. Imagine! ALL of this is possible while you are learning to connect to your own inner wisdom so that you can fully experience your own LIFE. Come on an adventure with us at Mar de Jade in Chacala, Mexico -- an incredible opportunity to learn Focusing or to deepen your practice. It all happens February 14 to 21, sponsored jointly by The Focusing Institute and Focusing International. 7.30 pm, Sunday, Oct 12. Tamar Park Buffer Discussion Area, Hong Kong Island, three minutes from the Admiralty protest site. 47 people in all were present, including six Certified Focusing Trainers and several trainees. They sat on the grass, quietly. They checked inside. The first words that came included: anger, fear, confusion, pain, exhaustion, strength, contradictions .…. In the small group and paired exercises that followed, they paused, passed a balloon, touched something placed inside their hands, described what they felt, and listened to a partner reflecting their description, and being their own listener….. For some, this was the first time they experienced peace and connection since the Occupy Central Movement began 15 days ago. The following are excerpts from what they shared in the course of the evening. “This activity about hitting hands enlightened me. At the first and second rounds, my partner was very agile. I got hit 9 out of 10 times, and every hit he inflicted on me was a hard one. At the third round, we looked at each other in the eyes. I was waiting anxiously for the gong. When it sounded I swiftly swung my hands up to hit him. But I was shocked to find that he just let me hit, making no attempt whatsoever to flee. I first thought this must be some kind of a strategy that he employed. The second time the gong sounded, I watched how he responded. Again, he just let his hands stay there, peacefully. I was surprised, but I hit anyway. When the gong sounded the third time, again, he did not withdraw his hands. I hit, but this time, much softer. When it was his turn, I was prepared for a tough revenge. When the gong sounded, I withdrew my hands very swiftly. But he just kept his hands there, not raising a finger. The second time he did the same. At the third time, I totally trusted him. I let my hands stay there. At the sound of the gong, he held my hands, lightly. At the fourth round, we were told we could do anything we wanted. ….At the sound of the gong, I took his two hands, and danced with him. …. The whole Hong Kong society is ripped from top to bottom, breaking up couples, parents and children, lovers, friends, colleagues at work, Hong Kong Chinese and Mainlander Chinese….. Much wisdom is required for a peaceful resolution. And healing is needed for many years to come. We are in a very delicate situation.There is a complex intricacy that is implicit. On the surface, the government and the students are scheduling a dialogue to take place some time next week. 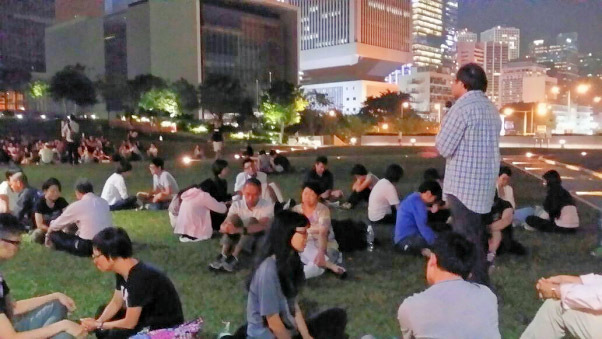 People continue to gather in the Admiralty site on the Island. 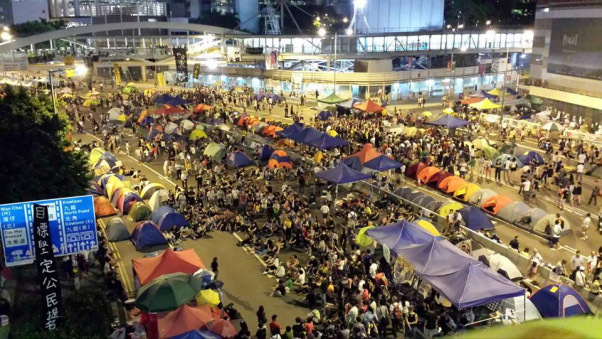 The 'occupied' area in Mongkok - the main traffic artery in the heart of Kowloon, has changed hands within the last 24 hours, from protesters to police and then back to protesters. There are increased conflicts between police and protesters, especially in the battle for control of the 'occupied' area. There are reports of police brutalities. Stories are also disseminated on the internet about how some policemen are friendly to protesters, including a video clip showing a young policeman sharing his own bottle of drinking water with a protester standing right in front of him when the protester cries out he was thirsty. There are indeed many sides to a movement. Sadly though, much damage is done, and the society is polarized. A lot of healing and reconciliation is needed. It is unfortunate too that many human weaknesses have been exposed. Too little that showed the bright side of human nature have been reported. Last night, in our Process Model class with Rob, some ideas surfaced. What motivates certain policemen to be so tolerant to the protesters, to be so self-controlling, and so friendly? Obviously, they embody certain values. What are they? As to students, they cry out for freedom and democracy. Instead of getting stuck in the VII formulation, can we go deeper into their more concrete felt meanings, and articulate back to their direct referent? There seems a dire need for people to listen. Hope the small focusing group that we have here can, in our very small way, beginning with our immediate living social networks, listen with open and attentive ears, help create a space big enough to hold more than one point of view, and help bring the next steps of re-recognition of and re-connection to the best that is in all of us. As acting president of the newly-appointed board of trustees, I am very pleased to give an initial report to our membership on the board’s progress to date. To begin with, the seven members of the board—Jim Iberg, Mary Jennings, Kevin Krycka, Susan Lennox, Jane Quayle, Executive Director Catherine Torpey, and myself—are all personally committed to creating a culture of transparency, communication, and responsiveness to the felt senses, needs, and fresh thinking of all members of the Focusing community. Our true role is to be trustees for the Focusing community and its mission, rather than “Directors,” and we have changed the name of the board accordingly. In collaboration with the International Leadership Council (also newly-appointed) we are undertaking a strategic planning process that will start with a mapping of the current state of Focusing in the world. There will be particular emphasis on groups and activities outside North America that TFI, as a US-based non-profit, may not be fully aware of. This mapping exercise will include a request to Focusing coordinators, trainers and practitioners everywhere to articulate their regional and local accomplishments and how the Institute can provide practical support and coordination to enhance their efforts. Based on the mapping and input from the community, we will work to clarify our goals and shared culture, set priorities for the future work of the Institute, and cultivate the resources needed to realize those priorities. 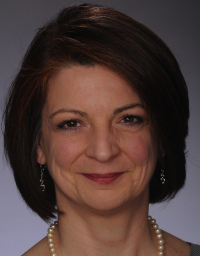 We are extraordinarily fortunate to have Catherine Torpey as our new Executive Director. With her background ministering to a Unitarian congregation and before that as a teacher, Catherine brings a high level of leadership, management and communication skills, along with a bright, warm and generous temperament. We are confident that under her guidance TFI has a bright future in promoting global “felt sense literacy,” leading to more fulfilling lives for individuals and a more caring and humane society. I feel honored to be entrusted with a role in the stewardship of TFI and excited about all that is waiting to emerge. Future issues of the TFI Newsletter will contain contributions from others of our diverse and very accomplished trustees informing members about how the board is going about meeting its governance responsibilities. Also, let me remind members that minutes of the board’s meetings are posted on the websites About Us page and we welcome feedback via email to board@focusing.org. We, the members of the ILC, want to let you know that we've begun meeting and are beginning to take steps forward. At this time, we've chosen to start working on issues that were identified at the Certifying Coordinators' Assembly in May of this year. We're planning to launch a page on the TFI website for the purpose of sharing these issues and others that we're addressing. As soon as it's available, we'll post the address of this page. When the Jewish new year began this past month, it was celebrated as it always has been, in conjunction with the Day of Atonement. As human beings, we love fresh starts. The past, which stands steadfast, unmoving, is often just what we are eager to move away from. The Jewish calendar, though, creates a pause after the new year. During the Days of Awe, the days between the New Year and the Day of Atonement, one is invited to give time and space for truthful, honest consideration of what in the past still needs attention. In order to truly be able to step freshly into the what is emerging, tradition calls for each individual to take stock of what has gone before; to deal with it soberly and honestly, and when necessary to take corrective action. To me, this ancient rite echos my experience of the Focusing way. I love those moments in Focusing when my inner and outer world are truly renewed, but that newness only truly comes when I give whatever amount of time and space is required to reckon with the old. As a Focusing community, we have a new Board of Trustees and a new International Leadership Council. As expressed in their letters in this newsletter, they are eager to have a fresh new start with all of you. And, of course, at the same time, there is the awareness that that which has gone before us is still very much with us. It is my hope, and I know that it is theirs, that whatever remains of the past which still needs time and space and compassionate attention will be honored and embraced. As I write this, I am in Portarlington, Ireland, where the Children Focusing conference is coming to an end. We'll feature more from this incredible experience in the next newsletter, but what I want to share now is that the retreat center where it is taking place is a 200 year old mansion that has been recently expanded and renovated. I have been moved to observe the way in which the architects managed to build new rooms and up-to-date facilities in a manner that truly embraces the old. In some physical way, the sleek, open, modern rooms have been constructed in a way that gives honor and deference to the old while bringing new wisdom and light. It is my dream that the new structures which we are building for The Focusing Institute might similarly honor both the wisdom of the old and the insight and energy of the new. The felt sense, of its own accord, brings the exact word, image, memory, understanding, new idea, or action step that is needed to solve the problem. The physical body, in response, will experience some easing or release of tension as it registers the "rightness" of what comes from the felt sense. This easing of tension is what tells us that we have made contact with this deeper level of awareness and that we are on the right path. This two-year training in Focusing Oriented Therapy course, taught by Charlotte Howorth, will equip the Mental Health Professional to be more in touch with their own felt sense as they assist the client in staying with theirs in order to find their own right path. Join Us To Discover Your Untapped Wisdom! At the Coordinators Assembly back in May, Bebe Simon led Coordinators in the "Love Exercise." She explained that Gene Gendlin always began his workshops with this exercise to demonstrate the felt sense, and she wants it to live on. Click here to see an excellent video of this simple technique. November 9, 2014 in New York City with Charlotte Howorth, LCSW. The goal of this workshop is to increase each participant's comfort and expertise in Focusing. Sorry, this class is now filled! Starting in Winter 2014 in New York City with Charlotte Howorth, LCSW. Three modules, starting April 10, 2015, taught by Nada Lou. Spend three weekends in beautiful Stony Point, New York. Enjoy nine months of partnershiping with other participants! 10/2014 If you enjoyed the message in this newsletter from our Board President, David Rome, then check out his brand new book Your Body Knows the Answer. In this "eminently readable, engaging and wise" book, David ehances the traditional Focusing techniques with mindfulness and other Buddhist principles. You can buy it from the TFI store here. 8/2014 August 2014 In Focus Newsletter is now on the website. 8/2014 Descubriendo mi sabiduría corporal. Focusing. Español: By Salvador Moreno López. New book in the TFI store. 8/2014 イン・フォーカス April 2014 Japanese In Focus Newsletter.